I have a 14 week old male German Shepherd. I also have 2 Yorkies. The older Yorkie absolutely ignores the Shepherd. The younger and much smaller Yorkie refuses to leave the kitchen, which is large and the center of our house, and is essentially where the Shepherd stays. I do have trouble with the Shepherd biting but his behavior towards the Yorkie tends to be getting rougher or more aggressive. I have tried leaving him alone in the kitchen, removing the Yorkie and yelling "ouch". He seems to grow bolder. Otherwise, he is learning quickly and is very sweet but biting or gnawing is always an issue. I am afraid he is becoming aggressive, yet, it does also appear to be puppy behavior. I have him in training. They also offer puppy play time, which he loves. The play time seems rather rough to me but all of the puppies seem happy. I wonder if this could make him more aggressive. 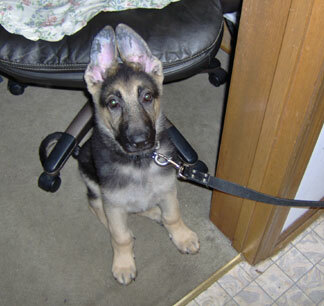 Comments for German Shepherd puppy is biting - aggressive? To discourage my dog from nipping, our family got into the habit of purposefully touching our dogs teeth during affectionate moments then saying "Owwie! ", then immediately everyone would frown and stop playing until he looked scornful. From there the fun could again continue. Another part was hand feeding kibble. If his teeth bit to aggressively, the food was denied, "Owwie!". This second part is also good to teach "Easy". It took my dog a short while to understand that his teeth could hurt a person but took much longer learning not to chew our stuff. I would also suggest you encourage some of that energy to be used up during play sessions since puppies have loads of energy and if a puppy has no way to vent that energy it often ends up in some sort of undesirable event such as you've just named, digging, etc. After all, a tired puppy is a happy puppy. Since you are already in training, which I am very happy to hear, I would bring up these issues with your dog trainer and discuss possible training options with him/her.